Another reading weekend, but this one combined with a vacation. The Circle for Asian American Literary Studies organized the reading at the conference of the American Literature Association, a coalition of author societies. Chaired by Nicky Schildkraut (University of Southern California), Meena Alexander and I read for a small but attentive audience. It was a pleasure to meet Meena and hear her read. She has an alluring voice, riverine. Born in Allahabad, India, she traveled extensively as a child and an adult, and has finally settled down in New York City, and become an American citizen. I hear in her poetry the unceasing question of what to adopt and what to let go. WCT invited me to join her at the party thrown by Electric Literature and Flavorpill, with special guest Harper Perennial. We had a bite at Standard Grill to soak up the anticipated alcohol, then made our way to Le Bain on the rooftop of Standard Hotel in the Meatpacking District. The crowd was mostly younger folks, many dressed casually in jeans. I had on a suit jacket and tailored trousers. WCT looked smashing in pumpkin orange, with a matching orange-red crescent-shaped handbag. She introduced me to a Facebook friend, a poet who teaches at Marymount Community College, and is the colleague of S whom I got to know at AAAS and with whom I shared a cab from LaGuardia back home. WCT's friend had a male friend with her, a French guy who is writing a book on the paranoid style in the McCarthy era. The blog-post title is also the theme of this year's conference of the Association of Asian American Studies in New Orleans. Four days, from May 18 to 21, with 132 panels and roundtables, covering multiple disciplines such as history, literature, media, sociology, geography, performance and fine arts, ethnic studies, gender studies and women's studies. Many papers referred to the transnational turn that has taken place in Asian American studies. The field has moved from recovery of buried pasts to looking beyond the boundaries of the nation-state. The turn involves expanding the term "American" to cover the hemisphere, linking the States to the countries of immigrant origins, studying diasporas and analyzing globalization. Accepted to read at the Massachusetts Poetry Festival, wanting to spend a whole day in Salem, I took the overnight Megabus, arriving at South Station, Boston, at 6.00 AM. Then I realized that the first commuter train from North Station to Salem does not leave until 8:30 on weekends. I had The Nibelungenlied with me, and so read How Siegfried Came to Worms, and How Siegfried Fought with the Saxons, and How Siegfried First Set Eyes on Kriemhild. The epic reminds me much more of Arthurian romances than of the Iliad. Love plays as big a part as War. Poem: "On Watching "Die Walküre" for the First Time"
With LW, I watched on Monday Robert Lepage's Met production of Die Walküre, with James Levine in the conductor stand. My first Wagner music drama. Act One was gripping. Siegmund and Sieglinde, sung affectingly by Jonas Kaufmann and Eva-Maria Westbroek, fell in love as fate decreed for the long-lost brother and sister. Act Two suffered from too much exposition, exposing Wagner's weakness as a dramatist. Bryn Terfel sang Wotan and Deborah Voigt sang Brünnhilde but neither could save the narrative pace from sagging badly. Stephanie Blythe was a compelling Fricka, Wotan's wife who forced him to keep the sanctity of marriage, and so withdraw his protection from the adulterous (and incestuous) Siegmund when he fought against Sieglinde's husband, Hunding (Hans-Peter König). is a sign of home. this bottle makes a bloody wedding gift. yet keeps a promise intact in full view. this old dispenser gives an older shape. it saved a restless man dying of thirst. the holy olive from the healing shrine. Last Thursday I watched the Donmar Warehouse production of King Lear at the BAM. Derek Jacobi played Lear as a childish old man, an interpretation that robbed the play of some of its pathos, I think. He was electrifying, however, in the mad scene, in which he and blinded Gloucester (played by Paul Jesson) became ironic pastoral figures. The final scene, in which he entered carrying the dead Cordelia (played by a lackluster Pippa Bennett-Warner), was extremely moving. Poem: "Pleasures and Praise and Plenty"
Plenty I can do without, having dined with less. If truth be told, a cast-off jacket suits me best. the world’s applause, but recognition is not I.
the Baptist church, the balding head, the baby chair. For the Massachusetts Poetry Festival (next Saturday, people, in Salem), I have been asked to write an ekphrastic on an artefact from the Peabody Essex Museum. 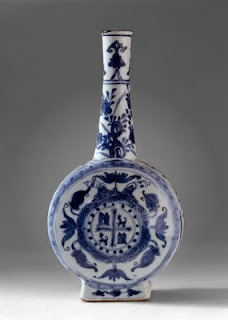 I wrote on this blue and white porcelain flask. this bottle makes a beautiful wedding gift. Please take it, sister, though it’s eight years late. from home, I was studying to be a poet. material fact back to a means of faith. Read on Sunday night with Ocean Vuong at JujoMukti Tea Lounge in the East Village, at a reading series curated by David Lawton. We read a poem each in turns, and the poems played off each other wonderfully. An electrifying moment happened when Ocean read his self-portrait as Jeffrey Dahmer, and then I read my self-portrait after Frida Kahlo. The body broken and eaten becomes the body put back together and giving nourishment. A number of friends came for the reading, Linda Lerner, Miriam Stanley, Jackie Sheeler, and Brant Lyon. GH was there too. Rachael Briggs also came, and read two witty poems written during NaPoWriMo. She, GH and I had dinner afterwards at the Polish diner, Odessa. I sold two books at the reading and traded with Ocean. Wrote my last poem for NaPoWriMo yesterday, a small poem about LB's reading on Friday. I enjoyed her inventiveness and admired her risk-taking. The poem about two stags in rut, with the scent in the air but not the presence of the doe, was very striking. Her mole poem gave me the idea for my poem. Marie Ponsot sat at the next table. It was a pleasure to speak with her for a while, though distressing to learn that she had a stroke, which rendered her for sometime speechless. We spoke a little about asking the stroke to speak. Poem: "What Do I Want"
talk about illness in a poem about the mole. its body into the ground. Star-shaped nose. is hacking and hacking into bunched tissues. after you end with Survival is a bitter malady.